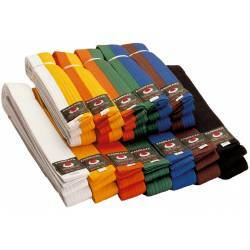 Basic line of karate kyu grade color belts from Kamikaze. Perfect for children, beginners and people with only a few years of practice: White, yellow, orange, green, blue, purple, brown and red colour belts. Two colored belts white-yellow, yellow-orange, orange-green, green-blue, blue-brown. All sizes. Higher quality brown belts from Shureido. New Kamikaze Presentation box for belts. 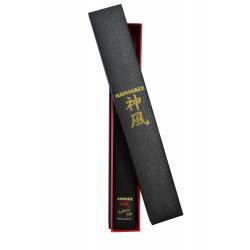 This luxurious belt box offers the finest touch to any rank belt presentation. 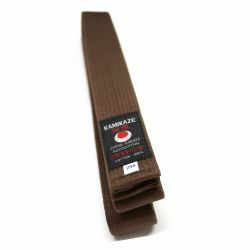 Coloured belts from Kamikaze. White belts, one color belts and two-coloured belts. 15,12 €	Upon request: Takes 80 days approx. 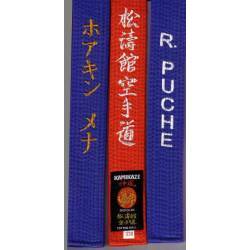 RED or BLUE competition belt from KAMIKAZE in cotton, special thick. Upon request: Takes 80 days approx.